The Made in Italy minimal diving watch, featuring our signature minimal aluminium black bezel with white Super-luminova® lumed dot, matching with the black matte stealth outline dial. Comes with a luxurious Made in Italy Horween Cordovan Shell strap, characterised by the seamless Unimatic two piece design and the newly developed fluoroelastomer black nato for a flexible usability either under the shirt or 300M below the sea level. Ultra minimal iteration of the iconic diver design. Classic Unimatic functional diving dial in a new outline lumed version. Modello Uno ref. U1-EM is the Made in Italy minimal diving watch. It features an iconic matte black dial with outline marker in White C1 Super-LumiNova® lume matching the pearl on the sterile black aluminium bezel insert, anthracite closed second rail and graphic trims. Time is indicated thanks to matching phantom ladder hands set and the black reverse lollipop second hand with off white tip. The double domed anti-reflective sapphire crystal provide best performance in every light condition. The solid 316 brushed stainless steel case, the screwed-in 2mm thick caseback, the 8mm diameter crown together with the high quality gaskets set provide a water resistance tested individually to 30 atm=300m=1000ft. Timing accuracy is guaranteed by the NH35A automatic movement tuned to 21600bph with 41h power reserve and hacking seconds hand. It comes on a Made in Italy 22mm black Horween Cordovan Shell two piece strap plus the new black Unimatic fluoroelastomer nato strap, with brushed SS signed custom buckle. 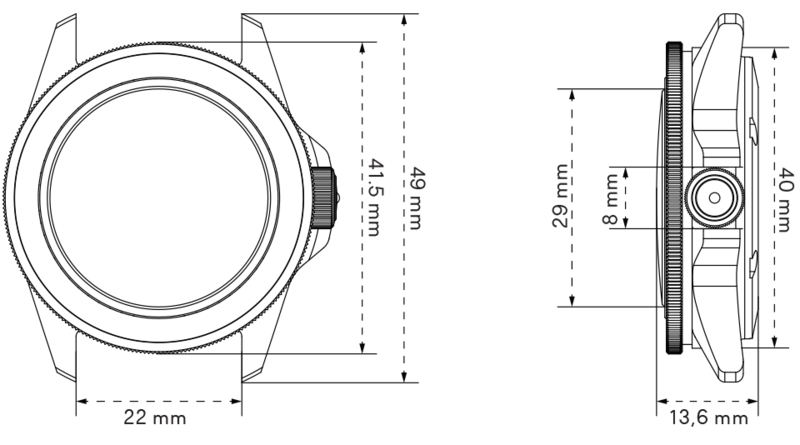 The caseback features the Unimatic conversion scale engraving and the individual progressive number. The watch is covered by a 24 months worldwide warranty and is part of a unique edition of 400 pieces.